Click on images and links for enlarged view. Images open in new window. 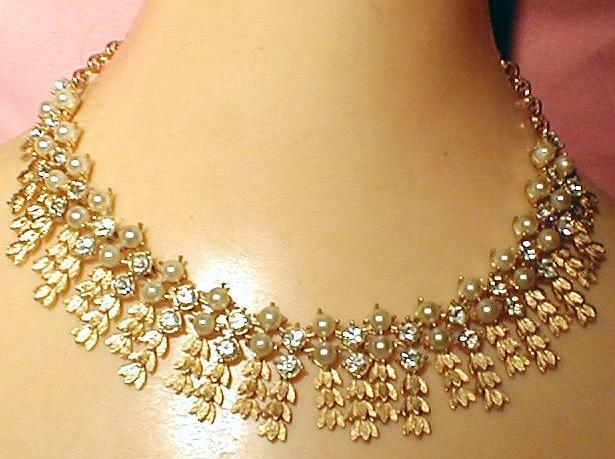 Detailed goldplated cast choker features double row of imitation pearls alternating with clear rhinestones. Gently tapering toward back it adjusts to 16" length with hook on extension. Bracelet is a complete match in design but with single row of alternating rhinestones. Earrings are clip. All pieces are marked SARAH COV. C:a 1960s. 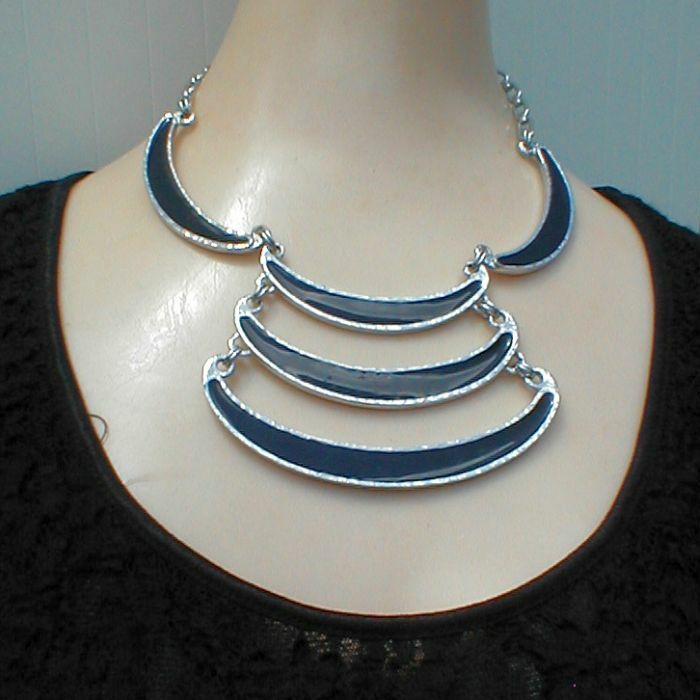 Sizes: Necklace, adjusts to 16" L, bib part: 1 1/4" W, Bracelet: 7" L, 1" W, Earrings 5/8" dia. 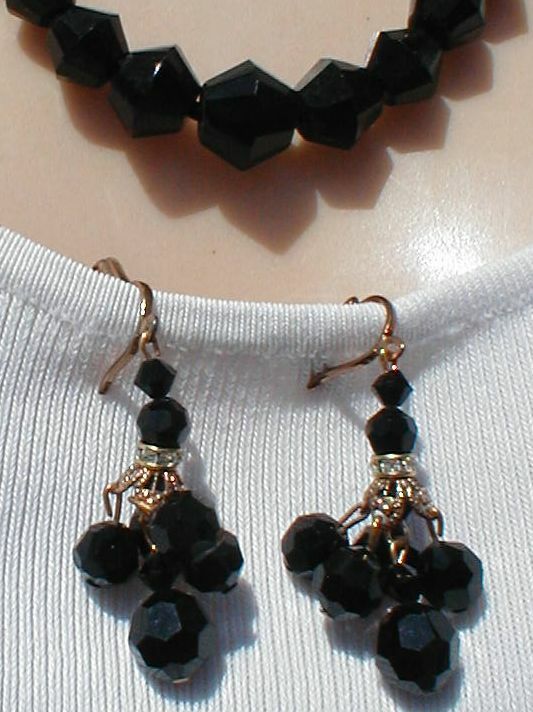 at top, total drop: 1 3/4"
Facetted black glass beads in perfect length, with go-with fancy 5-drop glass facetted bead earrings with rhinestone accents. 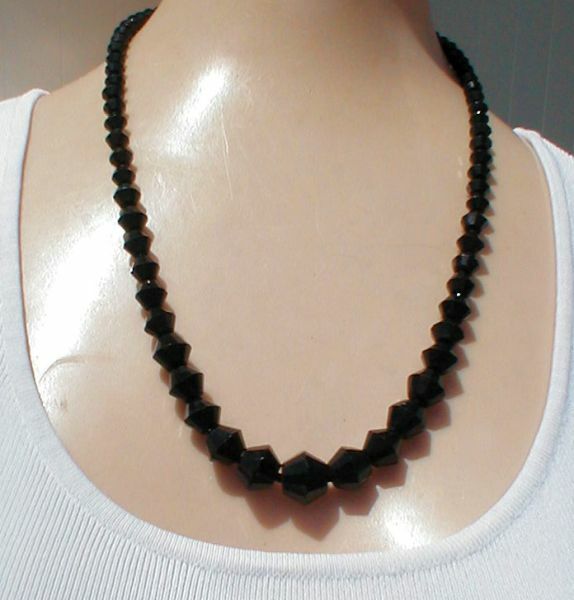 Sizes: Necklace 23 1/2" long, widest bead 10 mm approx. 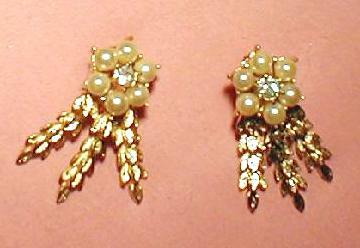 Earrings: 2" drop, with invisible clip, easily convertible to hooks for pierced ears. Jewelry is photographed on human size mannequin for better understanding of proportions. Clear rhinestones in open-work goldplated cast double links. 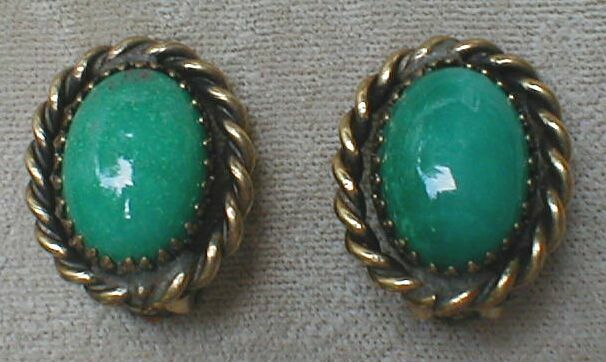 Marked CHAREL in cast and on back of earring clips. C:a 1950-1960. 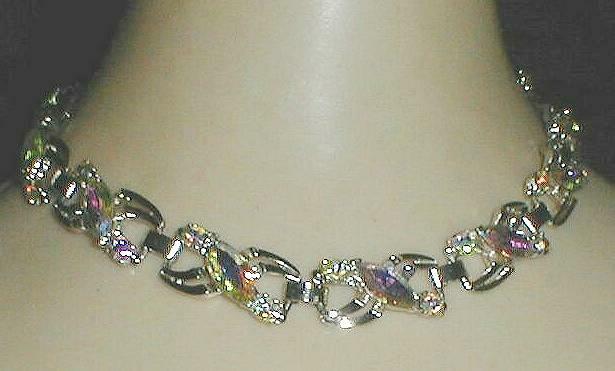 Sizes: Choker adjustable with hook to 16" length, width 1" approx. Clip earrings 1" across. Jewelry is scanned on approx. human size image background for better understanding of proportions. 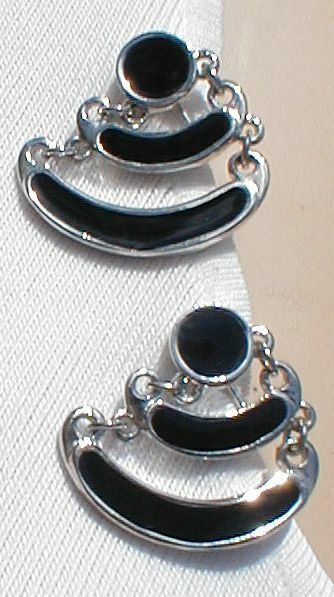 Three black enamel curved links on silver finish, with matching drop earrings, wear with white or black. 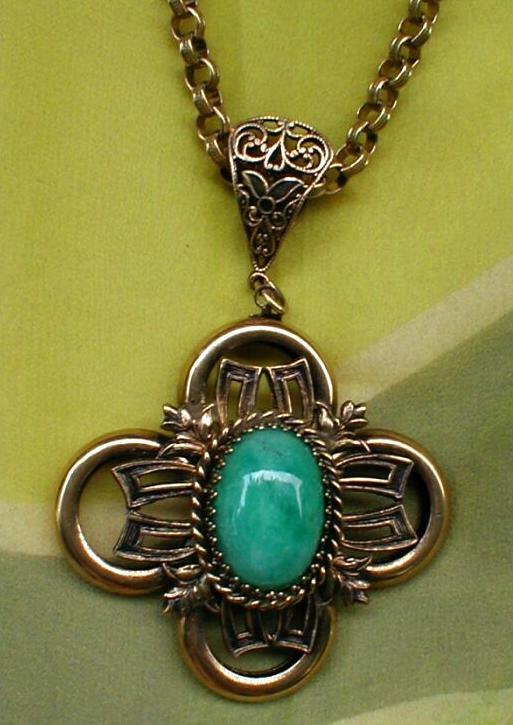 Necklace signed MANDLE in cast. 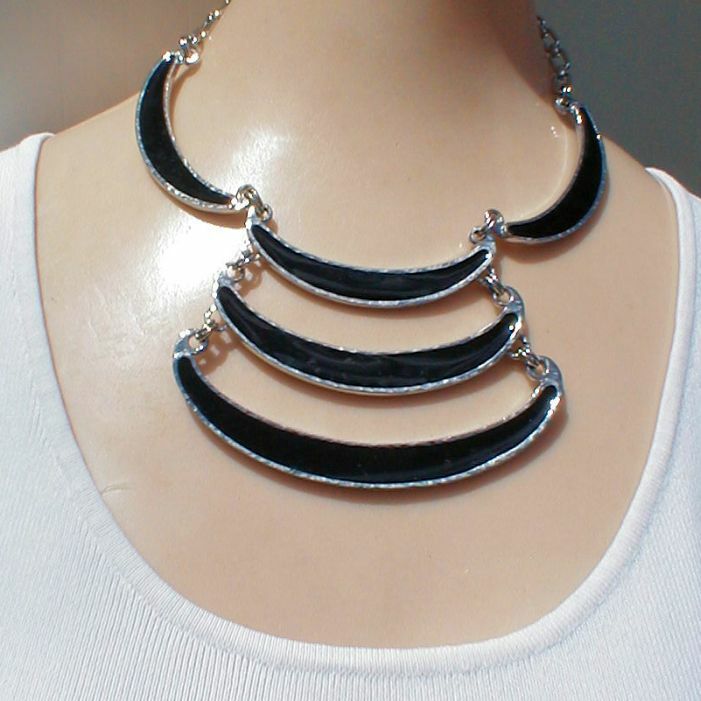 Sizes: Necklace: 15-16" long, with adjustable hook on chain. 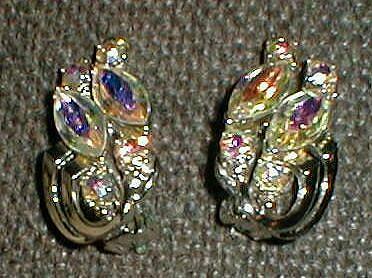 Earrings: 1 1/4" drop, with clip. C:a 1960s-1970s. Jewelry is photographed on approx. human size mannequin for better understanding of proportions. 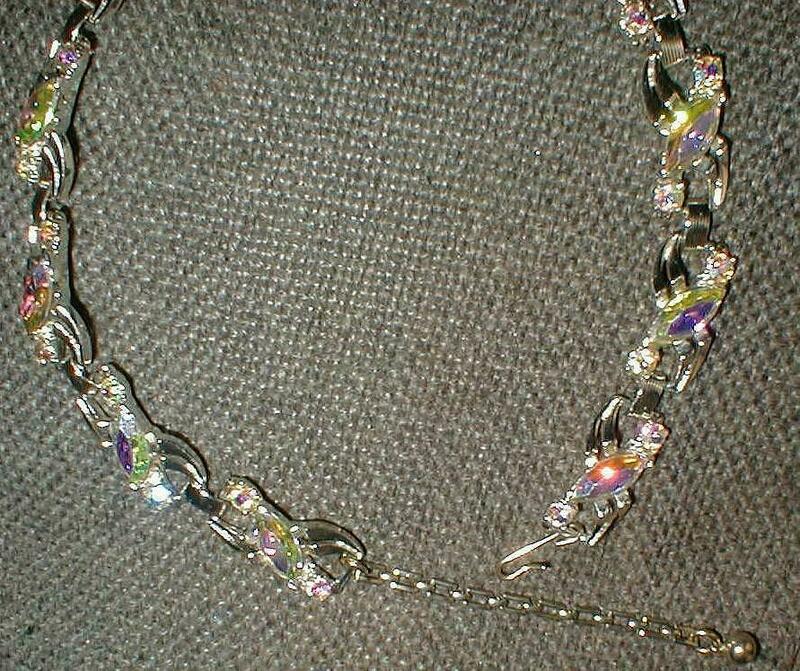 Aurora borealis iridescent large marquis stones with clear round rhinestones in rhodiumplated cast X links. Ca: 1950s-1960s. Sizes: Choker adjustable to 16" approx., links 1" W, earrings 1", wide clip. Hostess sets, only presented to Sarah Coventry home party hostesses for giving a party, are sometimes found in part but seldom complete. In rare pristine condition, this set named Celestial Fire from the 1960s looks like it was made yesterday. 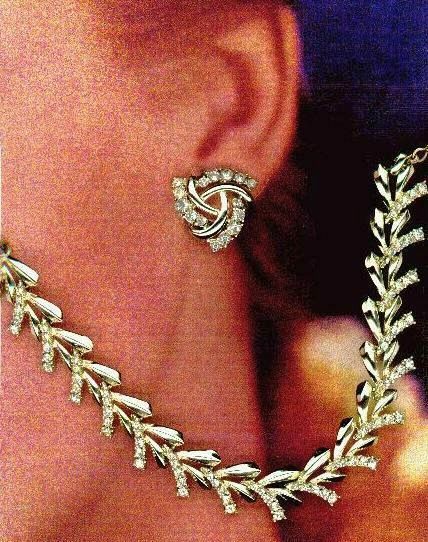 Goldplated links, clear rhinestones. 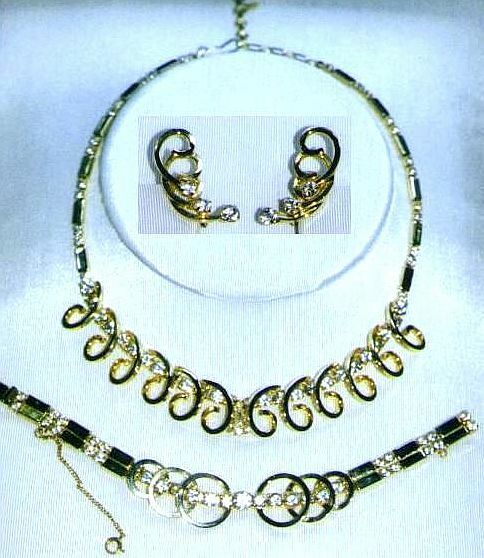 Necklace has a diamond-shape goldplated hangtag marked SARA COV., bracelet, earrings are stamped SAC within a diamond frame. Sizes: Necklace adjustable with chain to 17 1/4", front links 3/4" W, Bracelet 7" L, with push-in clasp, circle links 3/4" dia., Earrings, clip back: 1 3/8" L.
Renaissance-styled with touch of Deco, with fancy open-work, antique dark goldplating. Center oval green glass cabochon mimics malachite. Matching clip earrings. 1960s. Size: 24" L chain, Pendant drop 4", Pendant size 2 1/2" dia., stone 1" H.